This castle was probably built by Tancred, a Fleming, by 1120, and was occupied by this family until a later descendant Robert died in 1213. Meanwhile it had been rebuilt by [PEMB351] Earl Gilbert de Clare (see PEMBROKE (CLARE) EARLDOM) around the 1140's. 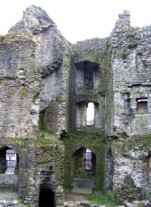 King Henry II visited the castle (c.1188) on his return from a visit to Ireland. Following the Tancred family, in 1213 the castle came under the care of [MARS371] Earl William Marshal (see PEMBROKE (MARSHAL) EARLDOM). Shortly afterwards in 1217 the castle was threatened by [GWYN389] Prince Llywelyn fawr ab Iorwerth, but he was bought off. 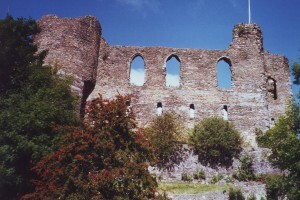 In 1220, Llywelyn's men did manage to destroy nearby Winston Castle, and also burn down Haverfordwest town, but the solid stone walls of the castle held. The male line of Marshal family eventually died out in 1245. Control of the castle then passed in 1248 to [HERE481] Humphrey de Bohun the younger (see HEREFORD (BOHUN) EARLDOM), whose wife Alianore was a granddaughter of the aforementioned Earl William Marshal. 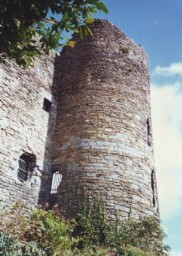 The castle subsequently resisted the Welsh attacks in 1257. Humphrey later sided with Simon de Montfort in the Barons war, and so forfeit the castle after the battle of Evesham (1265), in which he was captured and died shortly after. The castle was restored the family in 1274, probably around the time the new king, Edward I, was crowned at Westminster Abbey. 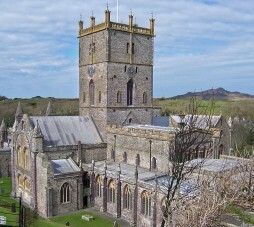 King Edward I & Queen Eleanor visited the castle (1284) whilst making a pilgrimage to the new shrine of Saint David, made in 1275 in nearby St. David's Cathedral. Eleanor was so taken by the castle that she made a deal with its custodian, by then [HERE491] Earl Humphrey de Bohun, and acquired the castle in 1289. She died the following year, after which the castle remained in royal control.